A water purification plugin equipment for thermal power plants to make use of waste heat and provide pure water adding value to the power plant fuel consumption. WaterApp provides multi-purposes of contribution providing pure water for different uses including for drinking and of improving efficiency of thermal power plant. Based on filtration of water vapors produced from heating of the feed. More than half of the fuel used for power generation ends up as waste heat instead of electricity. 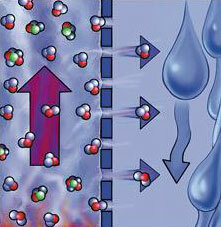 WaterApp enables recovery of this waste heat for water purification purposes. The waste heat produced by a thermal power plant is used to drive the WaterApp and purify any kind of water and remove all contaminants. With WaterApp technology this is possible at a low cost and minimized operating and maintenance efforts. In various third-party tests, the technology has shown more efficient purification of wastewater, semiconductor rinse water, brines, and water contaminated with nanoparticles than either state-ofthe-art distillation or membranebased separation or electrical and chemical separation methods. Some examples: Flue-gas condensate from a power plant in Nyköping, Sweden, produced water from gas-fields in Doha, Qatar and brine concentrate from a reverse osmosis desalination plant in Jeddah, Saudi-Arabia, pharmaceutical residues removal from Stockholm domestic wastewater treatment plant All tests showed excellent separation of contaminants and concentration of brine. It has better removal efficiency and more reliable performance than other water purification processes. HVR is a knowledge-based company established in 1996. The current WaterApp system is the result of more than 20 years of research and development within sustainable water purification in cooperation with academia, industry and international research groups. Thermal power plant owners and operators industries with available waste heat communities not connected to the grid small islands with their own power generator and mini-and micro grids.